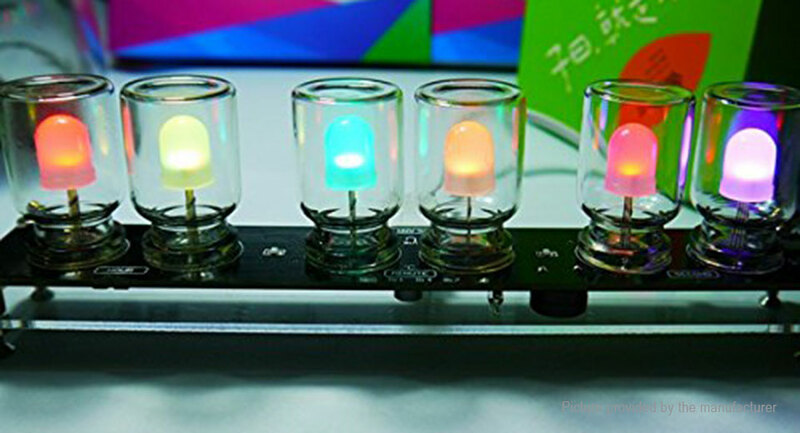 Use LED to produce different colors instead of numbers, if you need to know the current time, you may need some mental and memory activity (for example, as shown in the figure time is: 17: 31: 48). Additional upside down will be placed in "binary" mode to switch the display time. Four-way gravity sensor switch various settings interface. Join with temperature compensation ultra-precise clock chip DS3231, access to back-up battery power is still accurate travel. Upright placed chromatographic display time, press any touch key displays the "temperature" in the middle. Leaning forward, press add button you can set whether the whole point of open slightest sound of the buzzer, after closing buzzer only flashes to remind. Backward tilt place, press add button is turned on the alarm (the middle two LED lights up after opening), press set to enter alarm setting. Upside down placed switch to the "binary" display mode, pink stands for "hours", blue for "minute."